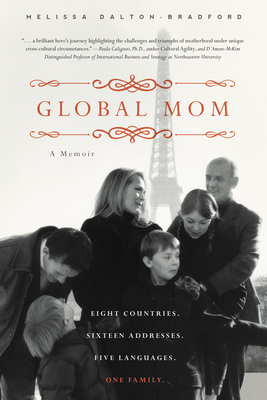 Melissa Dalton-Bradford is giving away one copy of her recently-released memoir, Global Mom: Eight Countries, Sixteen Addresses, Five Languages, One Family. With her husband and their four children, Melissa Dalton-Bradford spent years country-hopping: from Norway’s Northern Lights and the City of Light in Paris, to the speed of light of the Autobahn in Munich, to the deep tropics of Southeast Asia and the elevations of the Swiss Alps. This multicultural tale includes giving birth in a chateau in Versailles, singing jazz on Norwegian TV, living on an island in a fjord, judging an Indonesian beauty contest, navigating the labyrinth of French bureaucracy and the traffic patterns of Singapore, and sitting around a big pine table where the whole family learns languages, cultures, cuisines, and how to love this complex and diverse world and, most importantly, each other. In addition to telling grand stories of extraordinary adventures, Global Mom also serves as a wonderful guidebook for parents traveling internationally with children. Book Giveaway: Leave a comment and your email address at the end of this post, and you'll be entered in her random drawing. Or, if you prefer, send your comment via email to lmblogcontact(at)literarymama(dot)com. This book looks fascinating and just so good! I have done research on various countries in hope of one day taking my children on vacation to countries outside the USA. I would love to win a copy of this book.